Thank you for your interest in supporting Primary Day! Since our beginning nearly 75 years ago we have been enriched with an outpouring of support from an enthusiastic school community who have continuously demonstrated their belief in our school and its mission. They have furthered that belief through contributions of time, talent, and resources, allowing the school to grow and flourish. Like other independent schools, we rely on fundraising initiatives to support and balance our budget. One of our top fundraising priorities each year is the Primary Circle: The Annual Fund for PDS, which provides direct support to nearly all school programs. Parent volunteers are involved with classroom and grade-level events, serving as room coordinators, field trip chaperones, and by planning activities that enrich the curriculum, making the experiences tangible for the children while strengthening the home-and-school connection. 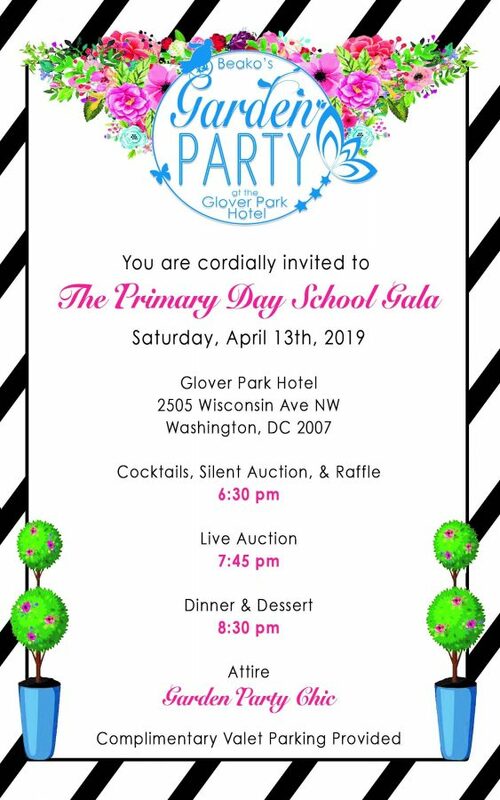 Events such as the Book Fair, the Auction, and the Spring Community Picnic provide additional volunteer and philanthropic opportunities to support the school. The school has a very active Parents Association with committees for community service and special events, to name a few. Your contribution to Primary Day makes a significant difference in the experiences of every one of our students. We encourage you to participate in any way that you can and we thank you in advance for your support. Make a Gift The most common kind of gift, cash gifts provide direct and immediate support to help us meet school needs. Pledges allow you to make monthly or quarterly payments on your gift throughout the campaign year. All pledge payments are due June 30, 2018. Many employers will match contributions their employees make to Primary Day, thus significantly increasing the impact of your gift. Some companies contribute $2 or even $3 for every dollar an employee donates. Contact your human resources office to learn if your employer participates in a matching-gift program. A gift of stock provides important support for the school while often resulting in significant tax advantages for the donor. Contact the Primary Day Advancement Office for more information. Make a Gift A gift to the Primary Day Annual Fund is one of the most important gestures you can make as a member of this community. As with most independent schools, the cost to educate each child at Primary Day is far more than the tuition charged for that child. Believe it or not, the gap between cost and tuition is 13% of the school’s operating budget! Your tax-deductible gift to the Annual Fund help to narrow this gap and will sustain excellence in our academic programs, provide professional development for teachers, strengthen the library and other resources, and support just about every other area of school operation. Moreover, your tax-deductible gift is the reason we can do all of these wonderful things without raising tuition to levels that would prohibit many qualified families from becoming – or remaining – members of our school community. You may think, “It doesn’t matter if I give to the Annual Fund.” Not true – your tax-deductible gift matters tremendously! Your child will be the direct beneficiary of your Annual Fund donation in this current school year. Even more importantly, your contribution to the Annual Fund is vital to the health and well-being of this community. A school is only as strong as its constituents. When we work together, we model behavior that we hope our children will someday imitate. When we work together, we show our teachers how much we value their dedication to our children, and when we work together, we show our neighbors that we’re a happy, inclusive community – a community that they will want to join. Your tax-deductible gift to the Annual Fund – whether it’s small or large – will help to strengthen our community. You might also be interested to learn that outsiders measure the health of our Primary Day community in large part by the percentage of parents who contribute to the Annual Fund. Government funding, grants, and the like are dependent in part on this critical figure. So please join together – parents, alumni, parents of alumni, trustees, faculty and staff – to support our wonderful school with your tax deductible gift to the Primary Circle: The Annual Fund for PDS today! We are honored to represent our parent community at Primary Day. This is a special place for our children to spend the most important years of their educational careers. The purpose of the Parents Association is to advance and enrich the sense of community of the school; to promote cooperation, communication and unity of spirit among parents, faculty, staff, trustees and students; to encourage understanding among parents concerning the school’s objectives; and to provide a means for parents to be of service to the school. The Parents Association does not participate in policy making and/or the development of curriculum. The PDPA is comprised of all parent volunteers and welcomes involvement from all PDS parents in events and meetings. Please see the Association by-laws at the following link: Primary Day Parent Association (PDPA) Bylaws. Information about upcoming PDPA community meetings and sponsored special events will be shared with the parent community. Below please find the list of Officers, Committee Chairs, and Class Representatives. Feel free to reach out to anyone on this list with any questions you may have or suggestions for a program or activity.